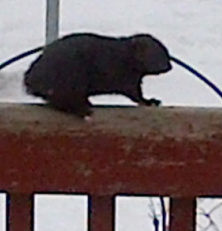 I've been trying to take a picture of my wounded squirrel for days, she moves pretty fast! I still have no idea how she was hurt, she lost her tail and both ears and has several cuts and scrapes. I did call the SPCA and they advised me to add ground corn to her diet, which I did and she seems to like it. She looks a lot better than she did a few weeks ago! I know some of you will think I'm nuts, but I just couldn't stand to see it hurt and not help. 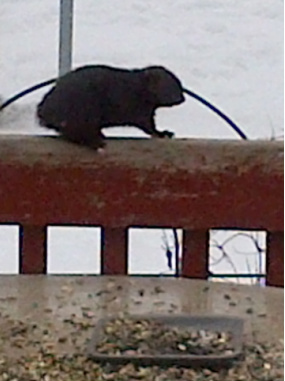 She's quite friendly and is a regular guest at my seed tray daily. I've been feeding the birds, squirrels and chipmunks for many years now and really enjoy watching their backyard antics! I am so glad to see that she is recovering! I had a wonderful mother/daughter day in the nation's capitol today at the Canadian Museum of Nature. My youngest is home from school on her reading week and asked me if I'd like to go to the museum. They have renovated since I was there last and the new Dinosaur exhibit was awesome! Many of the exhibits are either interactive or can be touched, which is much more fun than looking through a plate of glass. The whale exhibit alone was worth the trip. There was also an interesting art gallery on the top floor which was an unexpected bonus! This photo shows one of the new life sized Triceratops. Even though it's a 'veggie-saur', I wouldn't want to meet one in real life! 1. Use a metal spatula, I use a large icing spreader type tool, but any tool you can slide under the stamp without damaging it will do, to gently separate the stamp from the wood. If the stamp is older and the glue has hardened, pop the stamp into the microwave for 10 to 12 seconds to soften. 2. 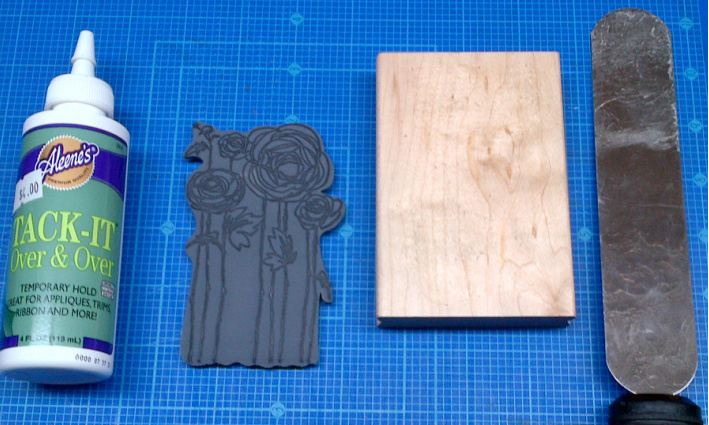 Once the stamp is separated from the wood, gently peel the sticker with the picture of the stamp off the wood block. There is more than enough 'sticky' on the stamp and the label to stick the label directly on the foam backing of the stamp. Trim with scissors to remove excess label. 3. 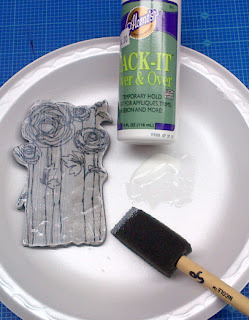 Apply Aleene's Tack it Over and Over with a small foam brush to the back of the stamp. 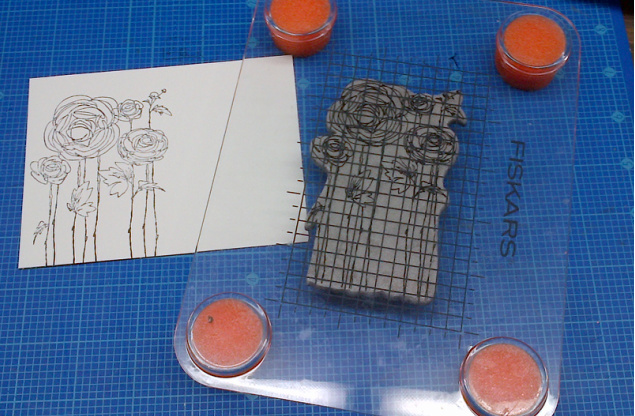 This will insure the stamp sticks to your acrylic block, or my new fav tool, the Fiskars Stamping Tool. Done! Try this tip, the stamp sticks and releases very easily, you can control the placement of the stamped image much better and best of all you can make room for new craft stuff!! Good morning everyone! The sun is shining, it's a holiday and I FEEL SO MUCH BETTER!! 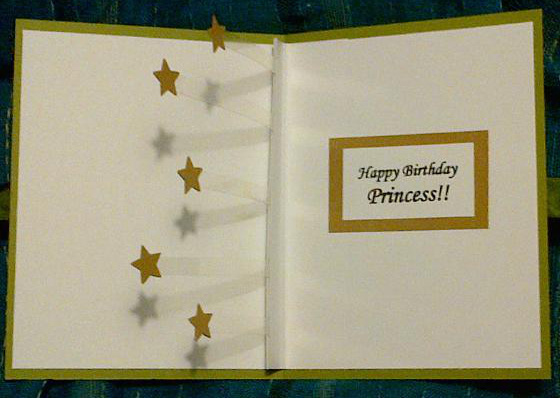 I made this card this morning, it's called a 'cascade or cascading card', it was quite a challange but now that I know how to put it together I am going to make another one this afternoon! While I was in bed with the flu I spent some time on the internet and came across a Youtube video featuring this card design, the video is titled, "Payper Box How to Make Cascade Cards". I have to warn you that this company is located in England, so the instructions were basically useless as their cardstock sizes are different and the measurements are in cm instead of inches, but I liked the idea and after fiddling with it I came up with my own template. I never did quite get the hang of the whole metric thing! As this is my first attempt at this card, I can see several areas where improvements are needed and I think it needs 'more stuff' on it! I'll have another go at it and post the results. Have a great Family Day! Sorry I haven't posted for a few days, I've got the flu. Tried to work in my craftroom this afternoon, but I'm too pooped out! I hope to be better tomorrow. I've been day dreaming about cards though, and I can't wait to post them for you! Like most crafters, I generate scraps a lot faster than I will ever use them...in a whole lifetime! The 'scrap rule' in my craft room is, "keep it, if it's bigger than a bear's nose". Needless to say, I have tons of scrap everything, from paper to fabric and I've made pledge to myself to do something about it. I'm going to dig through my scrap boxes before I cut something new up and I'm going to try make several cards a week just from leftover bits and pieces. This is my first official 'scrap card' and I will post them as I make them and maybe, just maybe, I'll be able to reduce the number of scrap bins, boxes and drawers that are currently taking over my craft room! Good afternoon everyone! Sorry I haven't posted anything for the past few days, I've been super busy getting ready for card classes. I went to Ottawa Friday to pick my daughter up from school and made a little detour to a few of my fav craft stores. Here's a little sneak peak at some of the goodies I brought back. 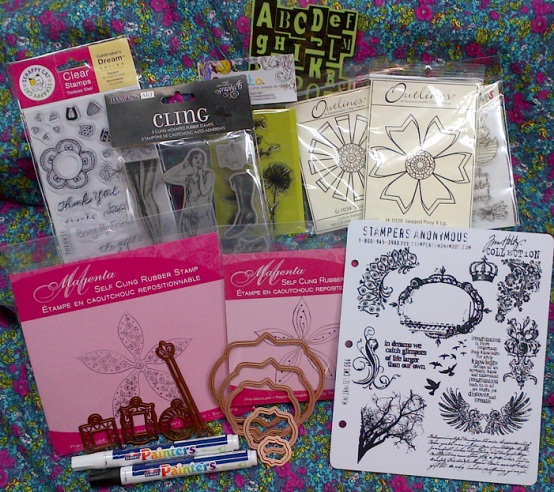 I stopped in at Heather's Stamping Haven and just my luck, she was having a sale! I've been 'oogling' over a few of these stamps and accessories for quite a while, and don't tell Heather, but I would have bought them anyway! For those of you who live near Ottawa or are planning a trip to the nation's capitol in the future, stopping in to her store is a must! It's packed floor to ceiling (literally!) 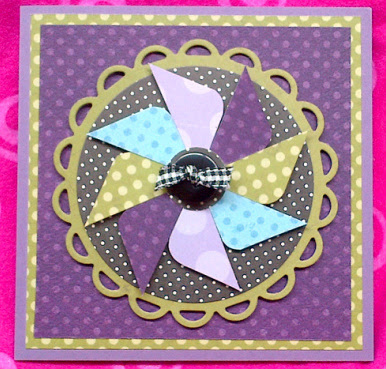 with every card making/ scrapbook/papercrafting stamp, tool, die, ink...you can imagine! Her walls are full of samples and she is one of the most knowledgeable paper artists I've ever met. I guarantee your jaw will drop when you walk through the door! 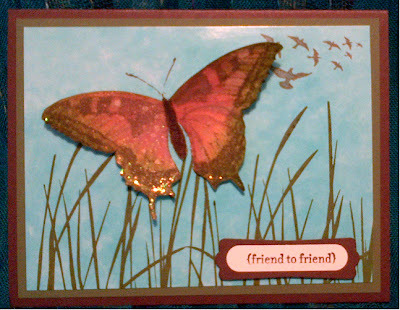 I love Fridays, especially the last Friday of the month because I get together with an awesome group of card makers! (Hi Girls!) 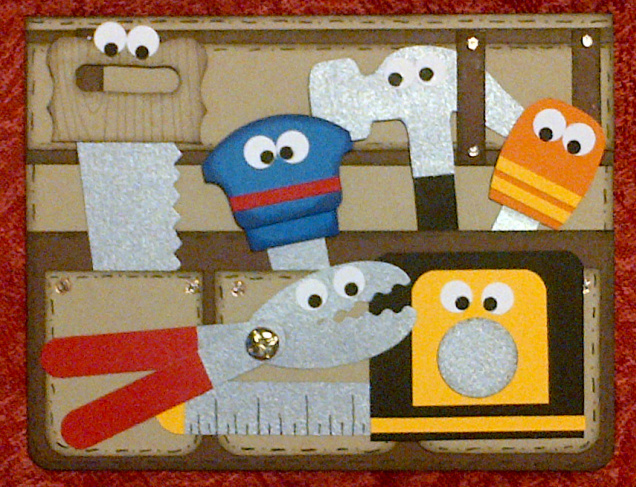 Last month they made a request, they wanted to make a 'Man Card', so I immediately thought tools! I've been doing punch art for as long as I've owned punches, a pretty long time, and I've made punch art tools and several variations of this card in the past. I have never up til now, put eyes on the tools to make them into characters. I got the idea for the eyes from Wendy over at http://www.stampingstyles.blogspot.com/, so thanks Wendy for the 'eye idea'! 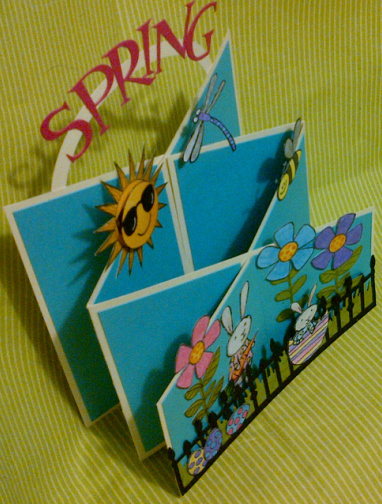 I am pleased with how the card turned out and can't wait to make with you guys! This card has tons of itty bitty pieces and will take quite a while to put together, but because we get together on Fridays and nobody has to get up for work the next day I think we'll be okay! I made the tools so that they are removable, just in case the 'Man' wants to play with them! 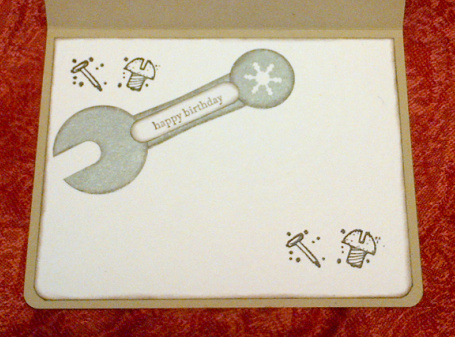 The inside of the card features a punch art wrench, I couldn't fit him on the card front and he was too cute to leave out! See you soon!! 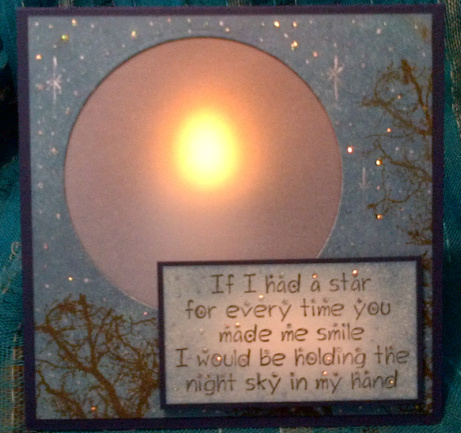 I was tidying my very messy craftroom this evening and came across this Sweet Treat Cup Card. I am posting it not because of the outside but because of the inside - not the M & M part!! I made the card front using Stampin' Up! 's 1 3/4" circle punch for the hole required for the Sweet Treat Cup. I used SU! 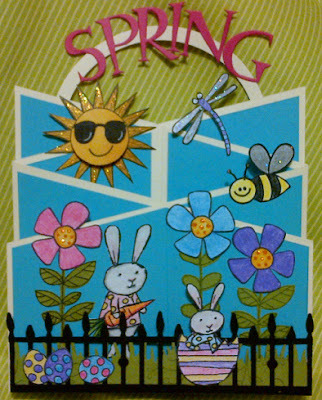 "Something Sweet" stamp set to create the image and layered the card front with coordinating cardstocks. After researching the 'mechanism' required for the recipient to retrieve the candy, and not finding an appropriate method, I did what I always do and made my own! 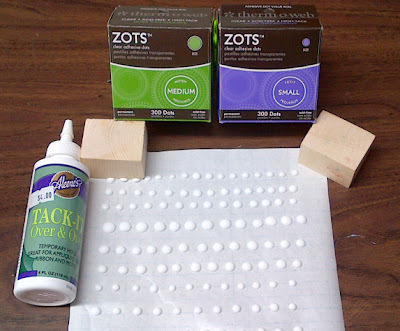 Some of the more well known methods involve several layers of cardstock, a ton of Stampin' Dimensional foam dots and a secret sliding 'panel door'. 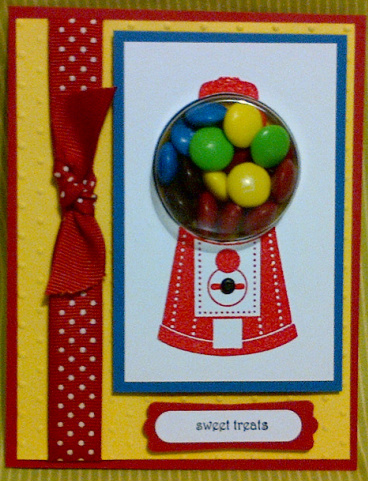 The recipient is supposed to pull the sliding panel to retrieve the candy, which promptly lands on the floor because the 'secret panel' is on the cardfront not the inside of the card. Tested it and failed miserably! To make a door that doesn't require copious foam dimensional dots or geomtry, simply attach a scored piece of cardstock over the candy and use a brad to hold the tab shut! The photo is sort of self explanatory, but if clarification is needed just let me know! 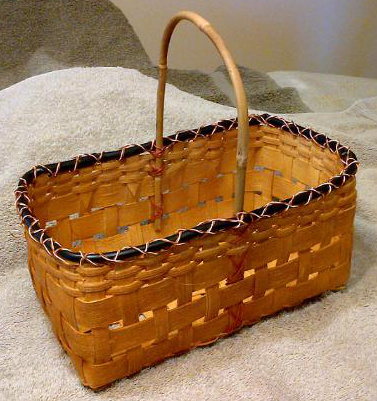 After fretting over my poor injured squirrel all day, and not getting a thing done or made, I decided to do something not to taxing and make some Baker's Twine. 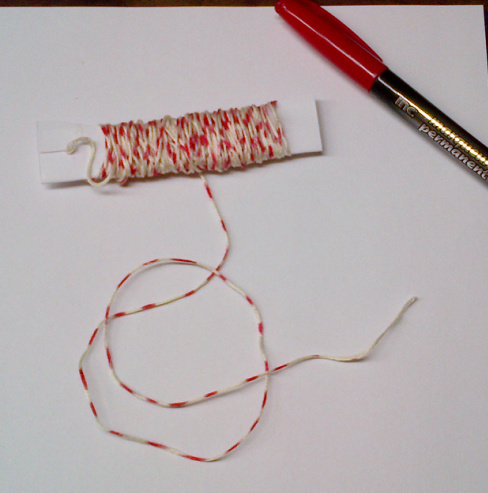 To make your own twine you will need some good quality cotton 'twine', I used a light vanilla coloured DMC embroidery floss and a permanent marker. I wrapped the twine around an empty bottle and taped both ends securely. Using a permanent marker draw fairly wide diagonal stripes, spacing them out by about 1/2". I allowed the marker to 'bleed' into the twine and coloured quite heavily. By chance I used a clear bottle so I could see the underside of the twine and how it was absorbing the ink. Let the twine dry for several minutes before removing it and wrapping it to store. I was a little nervous that wet ink might transfer to the uncoloured areas if the ink was not dry. I am very pleased with how it turned out and plan to use it this evening for card making. Total cost $0.33! (The total would be $0.51 if I included the cost of the Dollarstore marker). 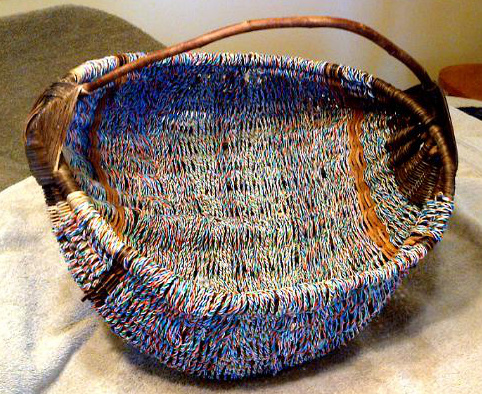 Either way pretty inexpensive Baker's Twine! 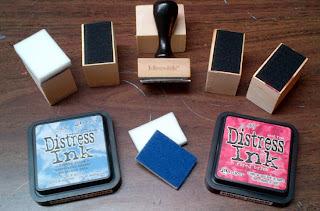 Those of you who know me, know that I am lovin' my new Distress Inks! They are made by Ranger and the designer behind the idea is my Guru, Tim Holtz. I have been introducing this line of Distress Inks and Distress products to my card making students and would like to share some of my 'budget-wise' ideas when purchasing and using them. When I made the decision to invest in this line of ink, I did some research on where I could buy them at the lowest cost. As we do not have a craft supply store that stocks these items I ended up ordering them online. I price compared online suppliers and ended up buying them through two different suppliers, http://www.trinitycrafts.ca/ and http://www.simonsaysstamp.com/. Both suppliers have every day low prices and shipping costs, Trinity Crafts is a Canadian Company and Simon Says Stamp is American. I recommend both. The inks are priced at $4.99 and $4.95 respectively which is low compared to Michaels $8.95 per package. The next investment was to purchase the necessary tools to use these inks. 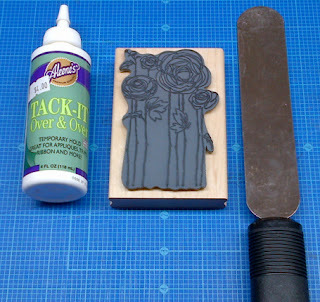 Ranger/Tim Holtz makes a 'vintage-looking' applicater tool which sells for $8.95 EACH at Michaels. Not in my budget! So I got creative and went to my local Disabled Adults Woodworking Shop and had them cut 24 wooden blocks to which I attached self adhesive, 1" wide, velco, and have been more than happy with the results! I found the velco on the 'real' tool came off too easily and was told by the company to "staple gun the velco to the tool', which I paid $8.95 plus tax for. Tsk Tsk!! Total cost of my version $12.00! 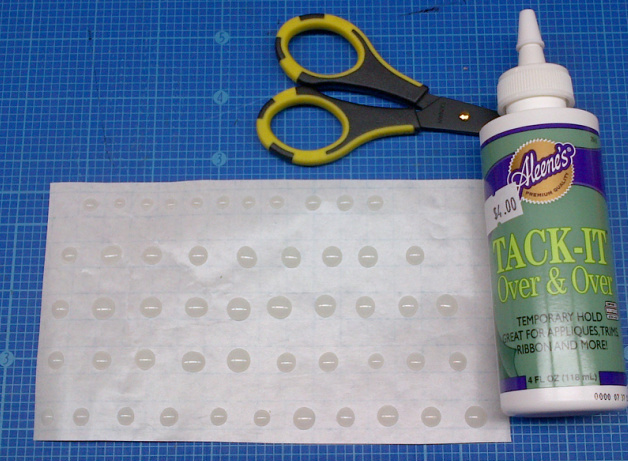 The next tool required is the "craft mat", which is a sheet of teflon, and retails for $17.95. Again, out of my budget. So, I went to my local Dollar Store and bought white MacTack for $1.00, and adhered it to a piece of white cardstock and made my own craft/splat mats, which work beautifully! 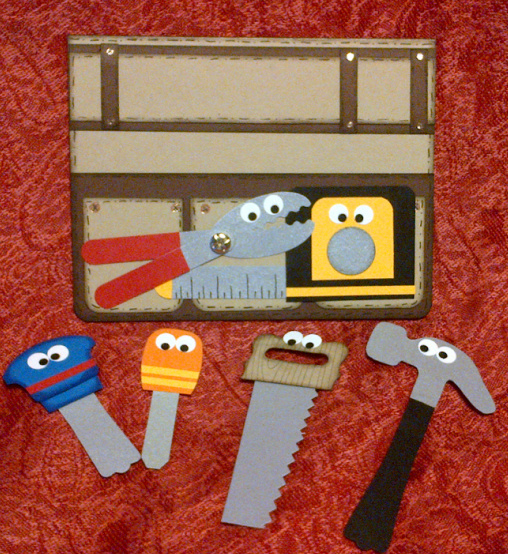 I purchsed 8 1/2" x 11" glass picture frames of the type that has metal clips holding the glass to the backing. This is important as this type of glass already has the edges ground smooth, which prevents nasty cuts! To be extra sure of not cutting anyone, I applied masking tape to the edges and store them in the original Styrofoam packaging to protect them and prevent chipping. I then purchased, online at Trinity Crafts, the necessary foam blending pads at their everyday discounted price of $4.99 for a package of 10. I did attempt to make my own foam pads, but without success so far, I'll keep trying! 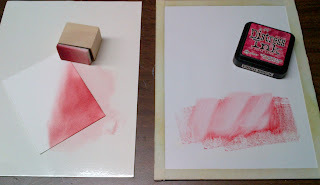 To use: Apply Distress Ink to glass plate directly from ink pad in a pouncing motion. Apply foam blending pad to blending tool and pick up ink from glass plate, loading the foam pad. 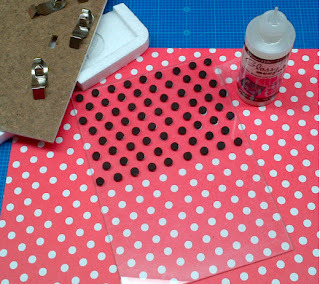 Apply ink in a circular blending motion to cardstock, using your homemade craft/splat mat as your work surface. Clean up is a snap with a baby wipe. You guesed it, I also make my own babywipes!! I really wanted a Tim Holtz Distress background polka dot stamp, but it just wasn't in my budget, so I did the next best thing and made my own! I checked out Youtube.com and found a great video showing how to make your own stamps. 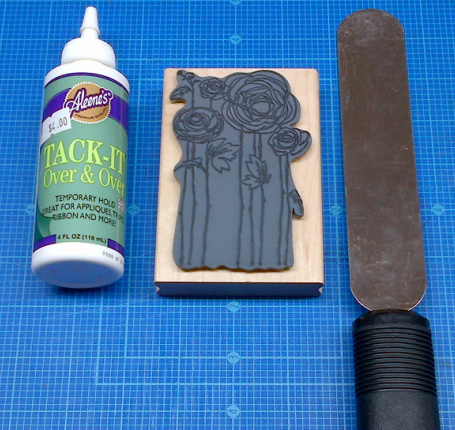 The video is called,"Homemade Foam Background Stamps:Part 1" by Luvleescrappin. I followed her directions and am more than pleased with the results! It took me about 15 mins to make and the total cost was $1.25!! I punched Fun Foam dots with my Fiskars punch and used a piece of dot paper as a guide which was recommended in the video, and glued the dots to a Dollarstore glass picture frame. This type of frame contains glass that has already had the edges ground smooth, so no sharp edges to worry about. I layered the dots two layers deep to give a nice crisp stamp and used Ranger Glossy Accents as the glue. I tested the stamp and I love it and plan to make many more! Give this a try and definitely watch the video, it's amazing. She makes a beautiful scrapbook page with her stamped image. Let me know how your homemade stamps turn out!! 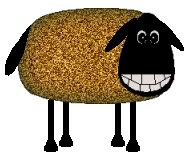 www.simonsaysstamp.com - reasonable discounted prices, free shipping to Canada on orders over $75.00, flat shipping rate of $5.99 on orders under $50.00, and $7.99 o orders under $75.00, they also have more than 100,000 items in inventory making them the largest supplier on the internet! 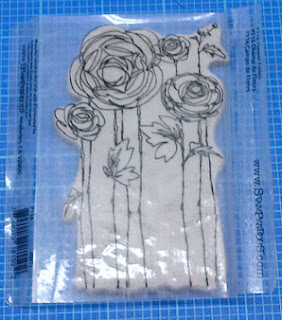 www.ohmycrafts.com - great prices and sale bin, good selection of brand name products and reasonable shipping rates. 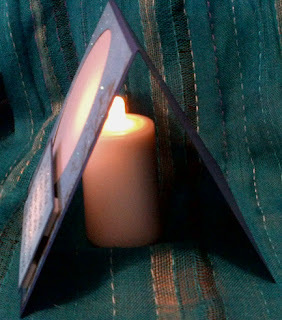 I will post individually all of the budget tips with photos where applicable so stay tuned budget minded paper crafters! Ok, are you ready for this? I bought these two boxes of Zots and paid $5.95 plus tax, bringing the total to: $6.73 EACH box!! 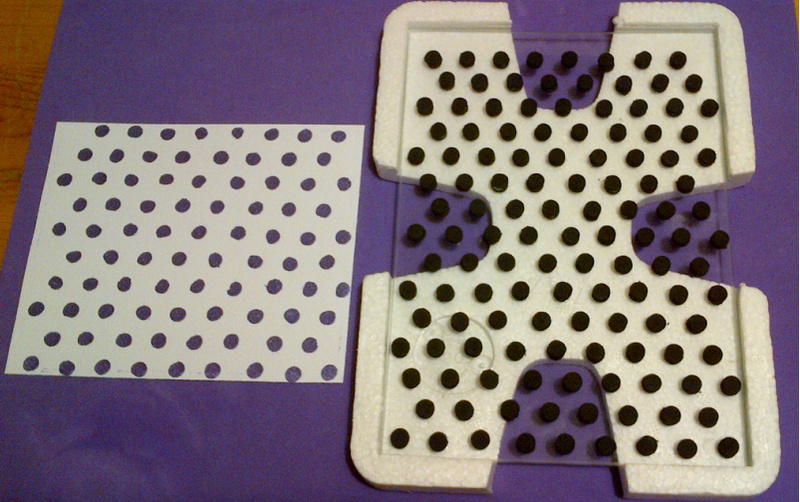 That means that each of the 300 glue dots cost $0.03 a piece. And I spent $30.00 on gas for the trip to Ottawa to the craft store to buy them! Crazy. 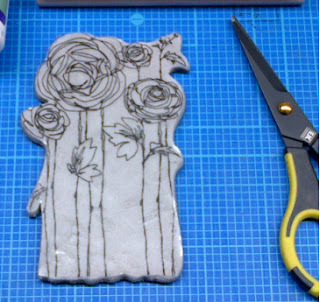 As many of you already know my New Year's resolution for 2012 is to reduce the amount of money I spend on craft supplies. I bought this bottle of Aleene's Tack it Over and Over at our local craft shop for $4.00 and can now make glue dots for next to nothing!! I tested them and they work just as well if not better than the expensive ones and if I waste 1 or 2, I'm not throwing my money away. 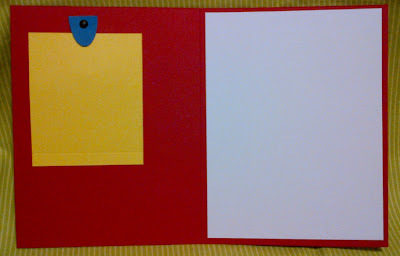 One important tip; you have to squeeze them out onto paper that will release the dot. Wax paper doesn't work. 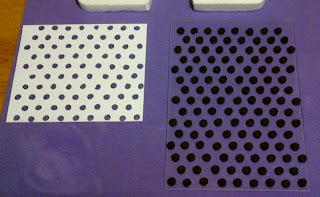 I used the backing off some Mactack that I made craft/splat mats with and that works great! 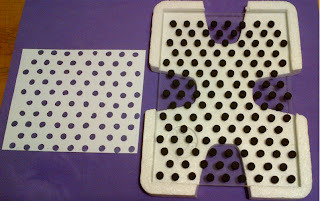 You could also keep the paper backing from glue dots that you've used, after all you paid almost $7.00 for them. Give this tip a try and let me know how you did. I love them and I can control the dot size too!! This glue is available in an acid free formula as well. It just gets better and better. 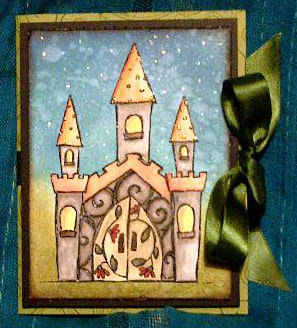 Whilst digging through my stamp pile today I came across this gorgeous castle stamp by the Stamp Barn, which I purchased at Heather's Stamping Haven. (Love you Heather!!) The stamp is called The Enchanted Castle and the website is http://www.stampbarn.com/ , an awesome company by the way. I haven't played with my watercolour paints for a while and thought I would paint myself a castle. I inked the ground with Peeled Paint and Forest Moss and the sky with Broken China and Faded Jeans Distress inks and splashed some water on it which gave it a 'cloudy sky' sort of effect. 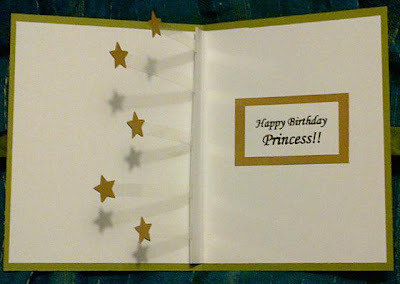 I followed up with some Stickle stars and cut it out and layered it a few times although my camera didn't pick it up. The inside has a trough in which little floating stars are dangling. I thought it needed a sentiment so I made one up on the computer, Happy Birthday Princess!! Hey gang! Just a quick post for now, but I'll be back with lots more later today! I have the day to myself in my craftroom and ya never know what will happen! 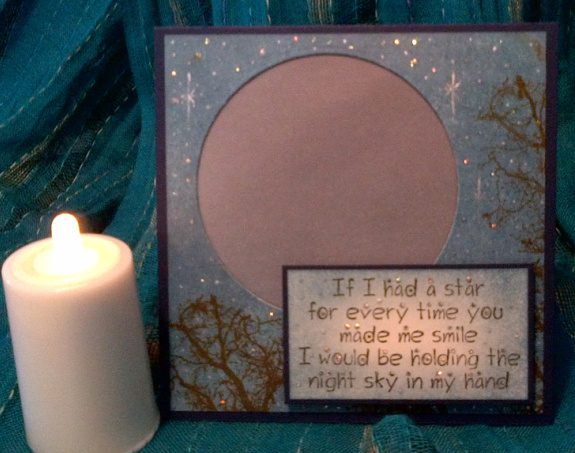 I always have lots of cards out on display in my craft room. It's where I hang out and I look at them for inspiration and always decorate my room for each season and special holiday. I leave some cards out on display all the time and this is one of them. This card always gets a comment from people who visit my craft room and I love watching the look on their faces when they open it to find 'the other half' on the inside! Hilarious!! I saw a card similar to this at a girlfriend's house last year and decided to make my own. I have no idea who the original designer is, but she's a clever girl. I made my own template for this card based on a more 'generous' body type, sort of like my own! She's a DD for sure but she fits into an A2 envelope perfectly!